Home / Chưa phân loại / Sushi Cat 2 is a fascinating story, nice music and a cozy atmosphere. In the second part of the game Sushi Cat, Cat came with his favorite toy in the shopping center “Tokyo Mall”. While he chose for himself sweets, evil dog noticed him a toy, and she really liked it. The dog stole toy and hid in the elevator. The cat ran in pursuit, but was unable to get to the elevator buttons. As always, he came up with the idea! In order to grow we need to eat sushi as much as possible. So, thanks to you, a cat strongly put on weight in the first few levels. When he got to the elevator, he saw that the dog had disappeared in the cinema. The cat ran to the box office to buy a ticket and to follow her, but ruthless cashier said that the movie is not for small kittens and it should still grow. Well, this is not the first time when our cat would have to eat sushi. His huge stomach is able to accommodate a ton. Sushi Cat 2 once again pleases us, not only the original gameplay, but also a fascinating story, nice music and a cozy atmosphere. 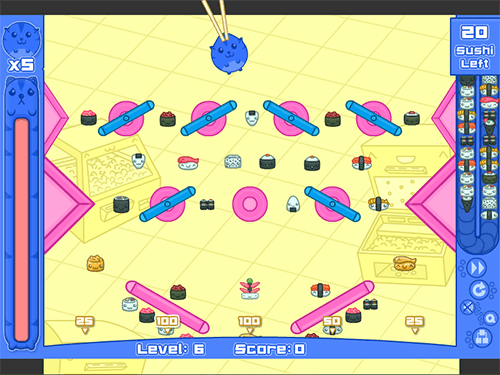 Sushi Cat 2 is a continuation of a cute funny flash game about a blue cat in the shape of a ball. You do not have to be an eccentric cat lover to enjoy this carefree puzzle. Funny animations, quirky characters, and simple operation, which consists in an ordinary mouse click at the right moment, will give pleasure to those who are tired of the monotony, and looking for the original game. In part, you have to rely on luck, because after you release the cat to eat sushi, you will not be able to control it, everything will make gravity. You’ll have plenty of time to fill the stomach of your cat. Now you should eat in each round from 25 to 30 sushi. You have 5 attempts in each level of the game. In each level there are 3 “gold” sushi roll. If you eat them, you can buy in the store cool clothes for your cat. Among the new bonus appeared supermarket sweep. If you eat them then you will be able to absorb any sushi roll on the playing field, just by clicking on them with the mouse. Be dexterous, you will have very little time. Use the opportunity to eat the most difficult of sushi. Now you can play cats pinball. Depending on the type of sushi roll, which you eat, points can be multiplied by a certain factor (x3, x6, etc.). Sometimes points are doubled. In addition to that if you have filled your stomach and eat more, everything is eaten in excess of your bonus points. While we could not find Easter eggs or cheats for this game. If you find, write us in the comments. Even children can play this game. In the game there is no adult images or foul language. Sushi cat develops decision-making skills and critical thinking. The game is equally suitable for both girls and boys. With each new level, complexity of the game increases. If you manage to complete the game, then we invite you to play in the next part of the game. On our site you can play online in Sushi Cat 2 game. Cat eats with chopsticks. Very funny video.